Seminar on "MicroGroove Technology for Commercial Systems"
Tuesday, January 29, 2013, 2 to 4 p.m.
Meet the presenters before or after the seminars at their booths. Join us for one or more of these presentations Tuesday afternoon. Download select presentations here afterwards. The Copper Alliance has organized a series of technical presentations from innovative industry experts who are active in the development of new applications for copper tubes. A tentative agenda and schedule is given below. For more information, see also the MicroGroove press release from October 31, 2012. Of special note is the presentation by Matt Holland from Super Radiator Coils, a company now offering heat exchanger coils made from 5-mm copper tubing. Charles Stout and Christopher Mueller of Mueller Industries will review the limitations of piping systems for containing and conveying refrigerants and show how copper performs in these high pressure applications. Newell Franks, Chairman and CEO of Burr Oak Tool Inc., will describe equipment for making coils with smaller diameter tubes. Ed Rottmann from Luvata will discuss new copper alloys for use with various refrigerants. Finally, Steffen Rieger from Wieland-Werke will describe how to optimize copper tubes for ACR applications. 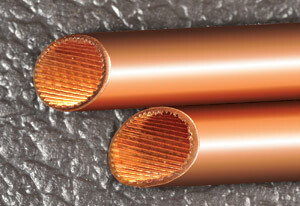 Tube suppliers, equipment manufacturers and coil designers are listed in AHR Expo Directory. A Directory of Tube Suppliers with contact information is also available at microgroove.net.